I work in advertising and as much as I'd like to say I'm the coolest girl ever who totally knows what's going on during the big game, I have to confess that I'm really just not that into it. Don't get me wrong, if my hometown is throwin it down in the Super Bowl, I get pretty into it. More out of a sense of pride for Seattle than a love of the game. So for me, this year, Super Bowl is all about the commercials and food. Looking for a quick, last minute snack for your Super Bowl Sunday spread? I've got the perfect idea for you. Full disclosure, this stuff is like CRACK! The combo of salty + sweet sings to all people. Dark chocolate coated potato chips - yes it may sound strange but it is 100% awesome. 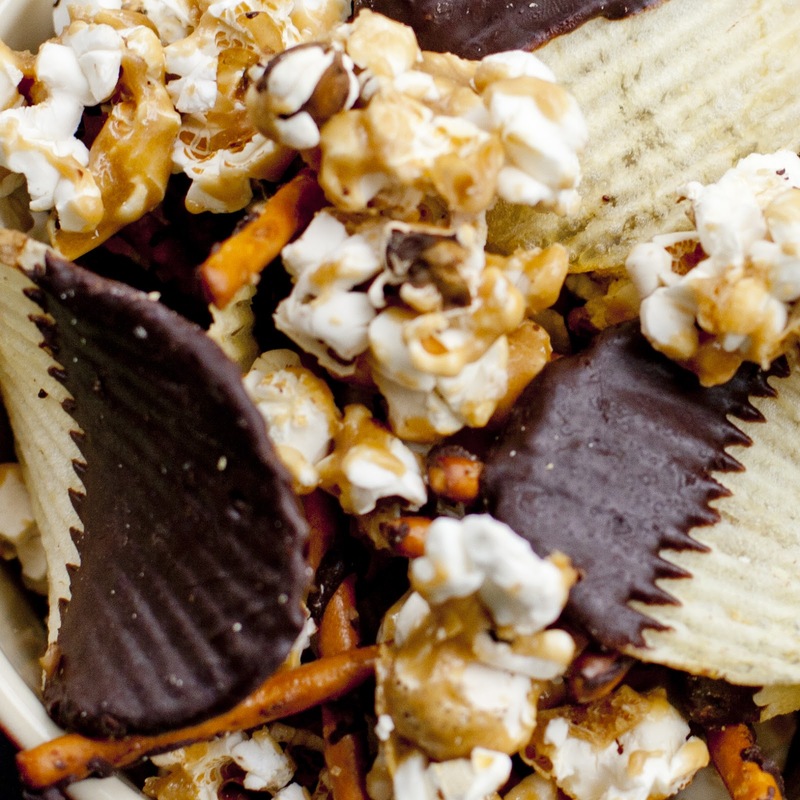 The salty, crunchy potato chip with the creamy, sweet dark chocolate make for an incredible bite. But it doesn't stop there. I've added in chocolate covered pretzels AND caramel corn. Yep, salty meets sweet meets salty meets crunchy sweet. It's totally craveable and has a little something for everyone. And hey, if you're not having a party, there no judging if you make a whole bowl for yourself. In a double boiler, place your chocolate chips and stir until it's almost all the way melted. Take off the heat and continue stirring until the lumps are fully melted. Line a few baking sheets with wax or parchment paper. Dip your chips half way into the chocolate and give them a good shimmy to drip off any excess chocolate. You want a thin coating. Continue until all of your chips are dipped. Continue with your pretzels. Place in the refrigerator for about 30 minutes to fully set the chocolate. 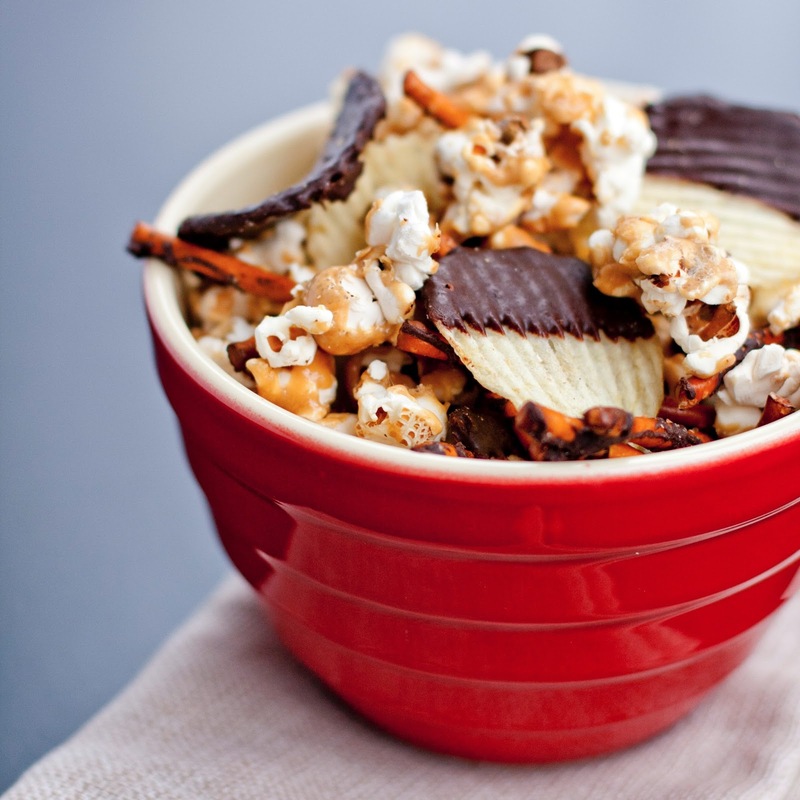 In a large bowl, gently combine the pretzels, chips and caramel corn. Done - easy peasy! you don't have to make your own chocolate dipped pretzels, you can buy them from the store. 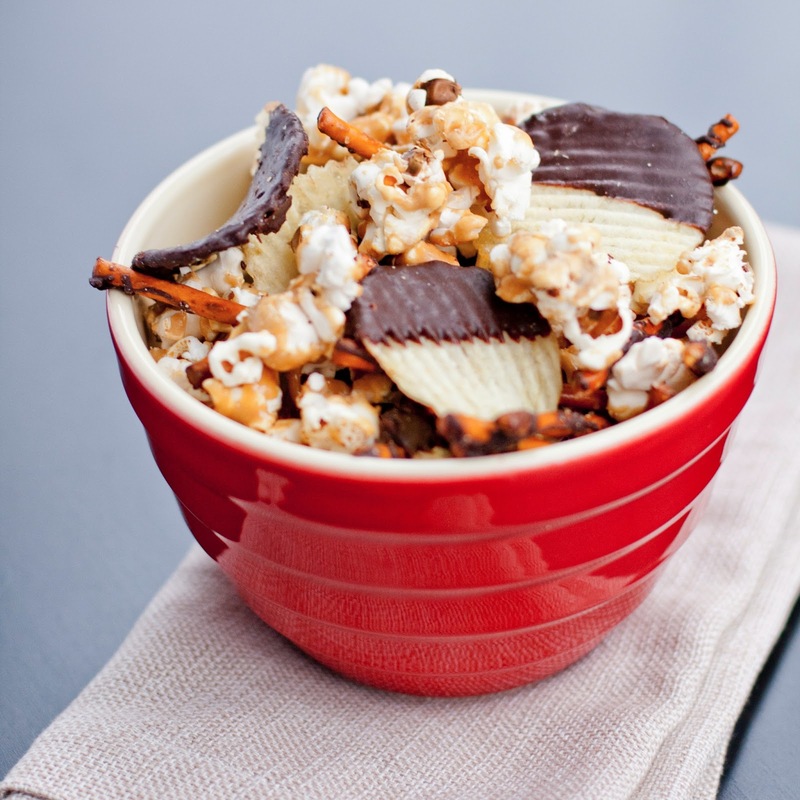 if your'e feeling even lazier, you can leave the potato chips plain and just do chocolate pretzels, ruffled chips and caramel corn. i totally recommend making your own caramel corn. i experimented with a few recipes and haven't found my favorite yet. use your own or take the easy way out and buy some of your favorite. adding in some other fixins would be delish. some cashews or really any of your favorite nuts would be tasty. granola clusters would be an interesting thought if you're into that sort of thing. if your chocolate starts to get chalky, it probably means you singed your chocolate. you'll want to start over. if it's just a little on the thick side, you can try thinning it down with a touch of butter. Oh wow.I'm truly cheerful to have gone by this site. concise and nicely explained blog. Thanks for the detailed recipe! Nice snack recipe.I am not good in cooking but i think this is a simple recipe that anyone can try out. I am a professional essay writer. I am good in writing best essays for college students. If you want a proper guidance of how to write an essay then chooses our site best essay writing service . I will definitely gone a try your recipe and i will tell you how they turned out.